Here are some of our top tips to keep our organic CSA vegetables nice and crisp- for as long as you can. Some of our veggies actually keep better on the counter- as long as they are not near the oven or in the sun. These veggies can also be kept in the fridge (see tips below)- they just do better on the counter. GARLIC: Store at room temperature, ideally in a cool dry place, out of direct sunlight. You can also store them in a closet or cupboard but not under the sink (avoid humidity). HERBS (coriander, parsley and basil): Put them in a mason jar with an inch or two of water at the bottom, just like a bouquet of flowers (change water on a regular basis). You can also put a bag over top of the mason jar to keep the moisture in. Place the jar at room temperature in a light area but out of direct sunlight. Herbs usually keep 2-3 weeks this way. TOMATOES: Store at room temperature out of direct sunlight. SQUASHES: Store at room temperature, ideally in a cool dry place, out of direct sunlight. You can also store them in a closet or cupboard but not under the sink (avoid humidity). If you have too many herbs for you to use, a great trick is to dry them by hanging them upside down for a few days! Use them up in your recipes for months to come! CABBAGE: You don’t need to bag up the cabbage. Just store it in the vegetable drawer- even when cut. CUCUMBERS: These are mediterranean crops- they don’t like too much cold. We keep ours in the meat drawer (if it’s empty) or on the top shelf in a slightly opened bag. GREENS (aka. swiss chard, kale, spinach, kohlrabi leaves, pac choi, beet greens, rabiole leaves, etc.) : If you have no room in the vegetable drawer, just put vegetables in bags to keep the humidity in. You can leave the bag open a little. HERBS: If you do not store them on the kitchen counter (as suggested above), you can also store them in a clear plastic slightly opened bag in the butter drawer. NOTE: Basil does not like cold and may turn slightly black in the fridge, depending on your fridge temperature. If so, it is usually still edible- it just does not look as great. LETTUCE: Also store in bags but on the shelf. ROOT VEGETABLES (aka. carrots, radishes, beets, turnips, onions, etc.). Also store in bags in the vegetable drawer. REMOVE the greens. If you are going to eat the greens, then you can store them separately in a closed bag. TOMATOES: Should be kept on the counter unless fruit flies become an issue. Fridges are too cold for the flies to develop but rob the tomatoes of their amazing flavour! ZUCCHINI: These are mediterranean crops- they don’t like too much cold. We keep ours in the meat drawer (if it’s empty) or on the top shelf in a slightly opened bag. 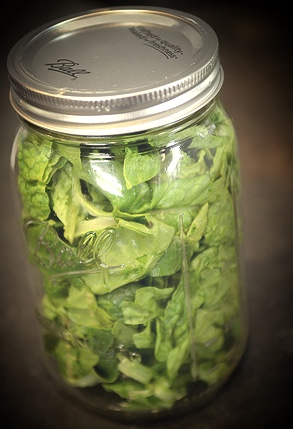 You can store greens in clear bags that you leave lightly opened. You can also keep them in containers and/or mason jars.